Cats have been enthralling us for centuries, and some say the French have even a deeper love of them. This book captures the deep love in poems written for centuries. Tales of confounding behaviors, adorable connections and wild tendencies. The oldest written in 1160ca-1210, and the latest at about 1995. The language the styles and the emotions given to the cats changes so much over time and yet there remains the love of this furry friend. Expressive illustrations add to the luxury of the poems and ad a whimsical flare. The first half of the book is the translated section, the second is it he original language French.I loved this book. I picked it up and read random poems everyday first in French as best i could and then in English. They flow so much better in French, it is such a beautiful language but I am not fluent enough to understand them. The English versions are wonderful. I love the idea of publishing the original language with the translated poem.I plan on gifting several copies to some of my feline loving friends and a few copies to myFrancophile friends. Disclaimer: Arc via Netgalley	This little collection is of French poems about cats. Shapiro translates the poems, and then provides the originals in the back of the book, making this volume idea either for those who read both English and French, or for a class for either language. The poems themselves cover a range of writers and periods. Marie de France is here as is La Fontaine. There are also more modern authors, including the famous Colette. The poem types range from fables to legends, to song version to the cat being symbolic of someone else. Some of the poems are either prose-poems or translated into prose. One of the funniest poems is “The Child and the Cat” by Henri Richer. There is a the rather interesting “The Cat and his African Relatives” by Francois Jauffret. There is some love poetry that isn’t as sick as saying cat love poetry sounds. There is pretty of humor. It is a charming little collection of poetry about cats, but really about cats and not Disney ones. T.S. Eliot would approve. So imagine a book about cats. Then imagine book about cat POETRY. Then image it's filled with gorgeous and whimsical cat and feline inspired drawings to bump the whimsy to a whole 'nother level.Then read it, and repeat the action until eyes melt from kitty goodness.That's what this is.That's... asdfghjkl;'lknsjkaflsbj Why was this never part of my life until now? Good gods -- French enthusiasts, book designers, cat and poetry lovers, book lovers in GENERAL of the world: you gotta read this book. Or at least flip through it. You can't not do so.-------------PS & Note to self: I really need a print copy of this ASAP. Okay, so I have a confession: I did not read every poem yet. They must be cherished and shouldn't be read all at once, in my opinion. I do have read enough to write a (short) review, so I'm gonna give it a try.I really liked this bundle! If the poems itself weren't awesome enough, the drawings made it even better. I could talk all day about how awesome these illustrations were, they were so cute!If you love cats, French things and poems, this is the book for you!One more thing: can I have a cat please? For those of you that have been around since I started book reviewing, you know I love books about cats. I will read any genre, even genres I usually don't like, if I find a book in the genre about cats. Typically, I don't road poetry. In fact, before now, I think the last time I read poetry was when I read the Shel Silverstein books when I was a kid. It's just not one of those genres I enjoy. However, when I saw a book of poems about cats, Fe-Lines, for request on NetGalley, I wanted to read it badly. Unfortunately, I ended up disappointed. I was hoping that I would be able to identify with Fe-Lines, and that it would make me laugh. In actuality, I was extremely bored. I found the whole book to be tedious. In fact, towards the end of the book, I found myself skimming through the poems, just to be done with the book. The only reason why I chose to give the book two stars instead of one is that I liked the illustrations. Most of them were adorable, and fit well with the poems. That was the only thing I found enjoyable throughout the whole experience.Based on my reaction to Fe-Lines, maybe poetry isn't my thing after all. I think it will be quite some time before I pick up a book of poetry, and try it again. The book didn't give me that joyful feeling I usually feel when I read books about cats, and stumble across a quirk that I can identify with, because I've seen my cat do the same thing. If you like poetry, I would recommend at least trying this book. However, don't go into it with high expectations. I don't usually read non-fiction, so picking up this volume was a bit of a departure for me. I do love cats, though, so that helped me make up my mind to give it a try.Poetry can be a difficult subject to discuss because the flow and the content make it a very personal topic. This is a volume of translated work, which made the assortment of poems even more interesting. There are pieces in it from hundreds of year ago to more modern times, which is a nice variety. Some of the older pieces I did not care for because the language was a product of its time and thus very different from what I am used to. This difficulty was especially evident in the older poems of a longer length.One of my favorite poems was The Cat and the Dog by Andre Auguste Tandon (1759-1824). It typifies the relationship between cat and dog in a humorous way. The translator had to do a bit of work with this one regarding the dog's voice as there's a stammer there, but I think that he managed to capture the attitude of the dog.Another favorite was The Clock by Charles Baudelaire (1821-1867). This was one that was more of the poetic prose sort that read more like a story to me, but in such a lyrical way that I would certainly call it poetry. It speaks to the cat lover's soul, illustrating the serenity that one might enjoy in the company of your feline.Something that was an interesting feature was that the first half of the book is the translated works and the second half of the book was the originals. It was not as much of a draw for me because I cannot read French, but for someone that does, it could be fun to flip back and forth to see the differences between the original and the translated work.The illustrations by Olga Pastuchiv were a great choice to include in this volume. Looking at them on a Kindle screen, they look like delicate pencil sketches that are smudged in just the right places. It gives the poems a sort of ethereal quality that fits most of the poems.The reason that I am giving this a 3 star rating is that the older poems selected for the beginning of the book were too heavy for me; they felt as though they were dragging too much.Another drawback was the introduction that also had that dragging feeling. It could easily be skipped, though, and wouldn't need to be read more than once if you were indeed interested in pushing through it. I have to admit, I never really understood the allure of poems. However, I love French things and j'adore cats too much. What a magnificent combination of the two! I really must thank Norman R, Shapiro for his work, all 384 pages worth of French poems about cats and the French people's deep love of the cat. At first, I thought Mr. Shapiro had written each poem. However, he worked tirelessly to give us CENTURIES' worth of poems about cats that were originally written in French, and translated each one into English for us English-speaking feline fanatics. Not only does he include the English translations. But he includes the original French poems, themselves, for those fortunate enough to be able to read the language and those of us who love seeing the beautiful words in print.The oldest of the poems was originally written in about the twelfth century up until the very last of the twentieth century. This span of nearly eight centuries worth of cat poems is a real feat that blows me away. yet, Mr. Shapiro was able to find each one and give us the gift of enjoying them. They say "When the student is ready, the teacher appears". I must say that I am beginning to understand the fascination of poems, given the desired topic. Mine just happens to be all things feline. I love the way that Mr. Shapiro used the play on words, Fe-Lines! what an ingenious way to put cats and poetry together in the title of the book. I must not fail to credit Olga Pastuchiv for her feline illustrations, also. Her art is simply magnifique!!! I absolutely recommend this wonderful book for all cat lovers! This would also make a perfect conversation piece as a coffee table book, as well! I love this book! Je t'aime, "Fe-Lines"!Thank you to the University of Illinois Press and NetGalley for giving me a free advance copy of this book to read and give an honest review. 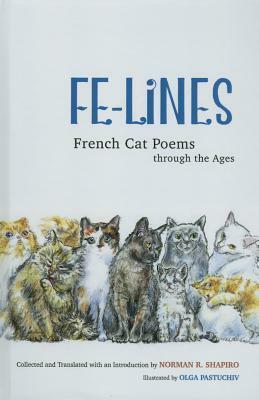 Fe-Lines: French Cat Poems through the Ages (Kindle Edition)Fe-Lines translated by Norman R. Shapiro and illustrated by Olga Pastuchiv is a delightful collection of cat poems any feline lover would adore. The translator writes his collection of poetry is best savored and I agree. You will find plenty of poems and lovely drawings to savor as you read Fe-Lines.The drawings are charming and much to this lovely poetry collection.You will find the poems in both English and French, so you can choose which language to read.Some of the poems I truly enjoyed included:*Epitaph for a Cat*Slaves (a bit of humor about why God created Man)*The Mice and the Cat-LutenistFe-Lines would make a perfect gift for any cat lover.Review written after downloading a galley from NetGalley. I have to admit that I am not a big fan of poetry but when I saw it was about cats I had to read it. I love cats.This book contains a little collection of poems with cats as either protagonists or as "muses" and Saphiro translates the original French poems to English (but provides the original ones at the back of the book).In my opinion, the early poems from the 1700s are very hard to read since they were written in "old French" and subsequently translated to "old English" but overall I enjoyed reading this book and the cat illustrations were very pretty.In addition, although I do not speak French, thanks to the poems provided at the back I realized that in fact I can understand enough. Switching from the original poem to the translated one proved to be a useful learning tool.—P.S. I Love That Book! Thanks to the publisher and Netgalley for an eARC of this book. A book of poems, translated from the French, that is all cats. From ancient times to the present, it presents poems and illustrations all about cats. The author discusses the difficulty in translating poems and I think he has done an excellent job in preserving rhythm and content. The illustrations are delightful and done by someone who has spent time with cats and understands them. A delightful book for those who like cats. The French aren’t the only ones that love cats, but this book shows how much their love affair with the cat is. I love cats and poetry. Hence, this was a natural read for me. I love this book and highly recommend it. Author Norman Shapiro translates the poems, and then provides the originals in the back of the book, making this volume ideal for those who read either or both English and French. Of course, this book is all about cats. The poems cover the modern and classic.Overall, for anyone that adores poetry and/or cats, I highly recommend this book for you. I am a big cat lover, but never have been fond of poems, but the cover illustration really caught my eye. I found that I truly enjoyed reading the many different poems which have been translated by the author from French to English...the original versions are at the back of the book. I highly recommend this to any cat lover who would like to loose him or herself in a bit of whimsy. This book was provided by the Author/Publisher through Netgalley for my honest review. I have not been compensated for my review. What a lovely little book of poems, exclusively about cats. This is not only translated from the French, but the French text is also included. It is not a book to be read at one sitting, as the author points out but to dip into at leisure, to grab a moment and think of the foibles of our feline friends. The poems start in 1160 to the 1900's and are illustrated with lovely pen drawings. I will certainly be enjoying this book for many years to come. if there is a feline in your life, invited or inherited or even one that saunters in now and again, pick up this terrific little volume of tribute to the cat. I thought I loved cats. Boy was I wrong! Mr. Shapiro loves cats and French cat poetry to the extent that he created a lovely, nearly 400 page, book translating France's historical love of cats for us to enjoy. The poems and occasional commentary from the translator, paired with Olga Pastuchiv's darling line drawings, make this a fun book to thumb through. Even Mr. Shapiro acknowledges his creation is not to be read like a novel, but to instead be browsed in those sweet moments of quiet (perhaps while you wait patiently for your kitty to finish his nap while pinning you to a chair). Being an egocentric American, I had no idea French literature dedicated so many lines to the feline, but I certainly enjoyed learning about it. A wonderful collection for any cat connoisseur or the Francophile. Thanks to NetGalley for a copy of this work pre-publication in exchange for a fair and honest review. *Thanks to the publisher and NetGalley for a digital ARC.This is definitely a niche title. If you are a cat-lover, poetry enthusiast, and Francophile, you will adore this book. I can take or leave most poetry, but I like cats, so I was predisposed to enjoy the poems in this book, and for the most part, I did. The illustrations are realistic and whimsical, and in truth, they were my favorite thing about the book. I received a free copy from NetGalley in exchange for an honest review.I liked the concept of this volume but it fell short for me. A lot of the poems were too stiff for me. To be fair I think I was looking for something more along the lines of “I Could Pee on This”. I was looking for entertainment and got something too serious for my mood. Now if you're a cat lover and a real poetry buff, this is going to be for you. If you're looking for silly cat poems, this is not for you.3 stars. I haven't read any poetry in a long time, but I do love cats so I thought this might be something I would enjoy. Unfortunately, it just doesn't seem to be my thing. I do love the illustrations included with this book though. This is a wonderful book. I'm going to buy a copy, so I can read it again, and read the original poems in French. Translated works are always problematic, and translated poetry doubly so, because the translator must capture not only the meaning, but the rhythm.